The demise of the Timberwolves in the mid-2000s was a multi-layered mess-up. And the firing of Dwane Casey is an overlooked part of what happened. 1) A failure to continue to build around superstar Kevin Garnett after the Sam Cassell/Latrell Sprewell marriage fizzled after one year, which was accelerated by questionable trades, questionable draft choices and — thanks to the Joe Smith deal — no draft choices at all. 2) The eventual trade of Garnett, a transaction in which the Wolves received Al Jefferson, Sebastian Telfair, Gerald Green, Ryan Gomes and a pair of first-round picks in return. That happened in the summer of 2007, and the first Wolves winning season thereafter happened this year. 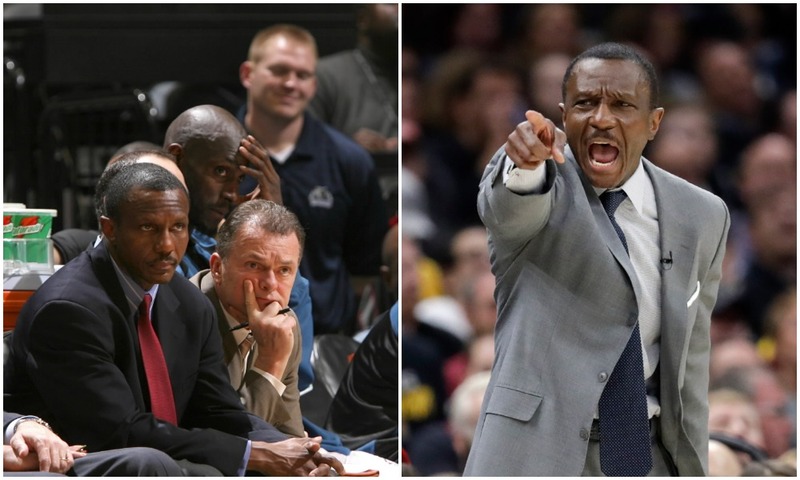 Caught in the middle, as a significant what-if and a sneaky contributor to the demise, is this: The midseason firing of head coach Dwane Casey in 2006-07. Casey had gone 33-49 his first season and had the Wolves at 20-16 in that second year. Then Minnesota lost four in a row, and at 20-20, after just a year-and-a-half in charge, Casey was dismissed. Randy Wittman replaced him, going 12-30 the rest of the year. Garnett was then traded, and the Wolves went 22-60 under Wittman the next year and 4-15 to start 2008-09 before Wittman was fired. Several versions of a rebuild started and stopped from then until now. Wittman’s work that year and the Wolves’ fortunes in subsequent years revealed this truth: Casey, after guiding a primary starting five of Garnett, Ricky Davis, Mark Blount, Trenton Hassell and Mike James to a 20-16 record at one point and a .500 record at the time of his firing, was a pretty good coach. If he hadn’t been fired, maybe the Wolves never would have traded KG. I have a feeling Raptors fans are about to experience the same longing for Casey after the news Friday that he was fired as Toronto head coach. Casey’s teams made the playoffs each of the past five years, reaching the conference finals a few years back and the second round each of the past two years. The Raptors had the best record in the East this year, but a familiar sweep at the hands of the Cavaliers sealed Casey’s fate. If being bested by LeBron James is your biggest crime, you’ve probably done just fine. Maybe the Raptors will make major roster changes in addition to the coaching move. As it stands now, the move was understandable but also akin to what happened more than a decade ago. In both cases, with the Wolves and Raptors, Casey deserved better. Warriors and Rockets are great models for Wolves ... and Vikings?